This tasty dish is a Sicilian classic. It's got a huge amount of flavor. 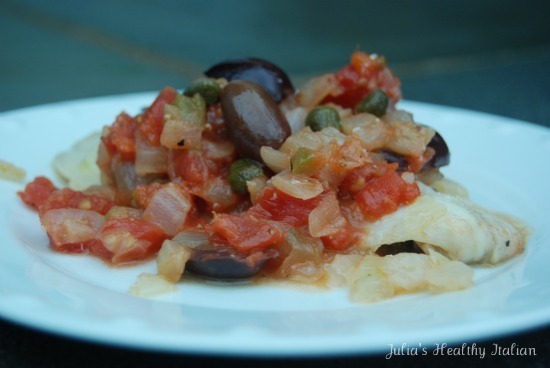 The olives and capers give it a savory bite, while the caramelized onions and fish have a mild almost sweet taste. It's super fast and really easy. This chunky sauce works well on chicken too or over pasta. My favorite is over fish. Add flounder fillets on top of onions. Turn flounder once after 5 minutes and cook for another 2 minutes then remove from heat- total 7 minutes. Place each fish on serving plate, set aside. To the pan add olives, capers, tomatoes, 1 tbsp of oregano, salt and pepper. Mix well. Cook for 2 minutes and add wine. Allow liquid to reduce by half. PS - I am a new follower and I love your site!